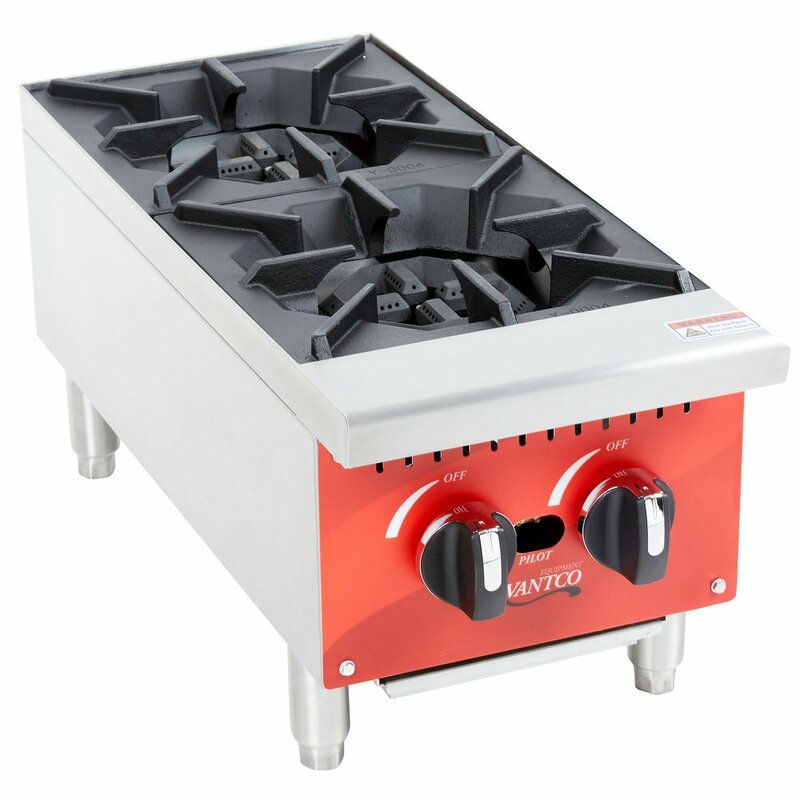 Perfect for busy operations that are tight on space, this Avantco RA-2-12 gas 12" 2 burner countertop range easily adds compact convenience to your kitchen! With a countertop design, the unit is space efficient, and with its (2) 25,000 BTU burners, it's ideal for whipping up sauces, sides, entrees, and even desserts. Operation is simple and intuitive too, thanks to the 2 large control knobs located on the front of the unit. Standby pilots are centered between the controls for ease of use. 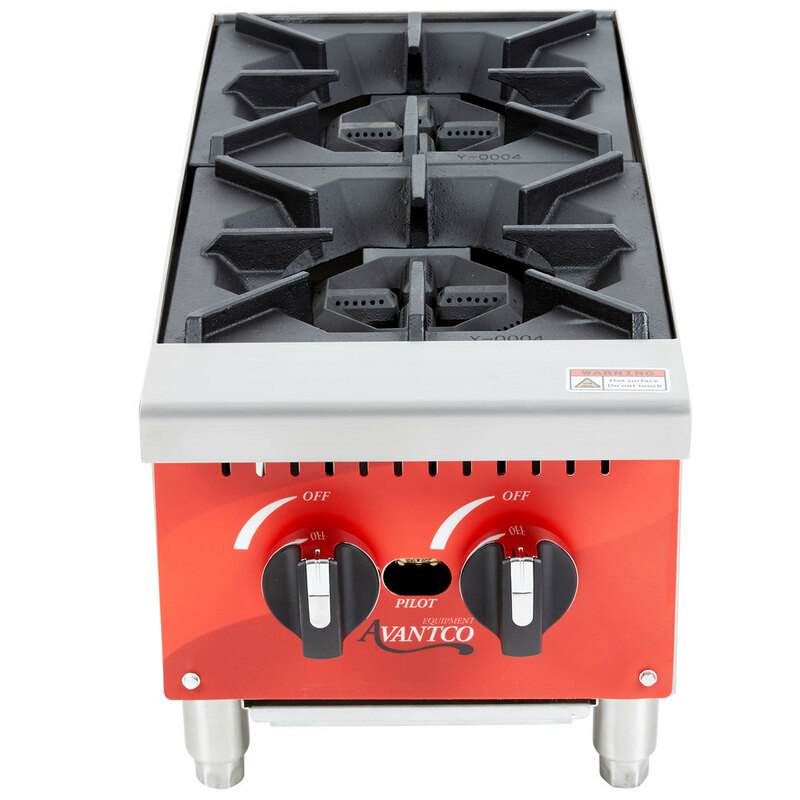 Unlike other gas ranges that necessitate either liquid propane or natural gas, this unit can be converted to utilize either fuel type. 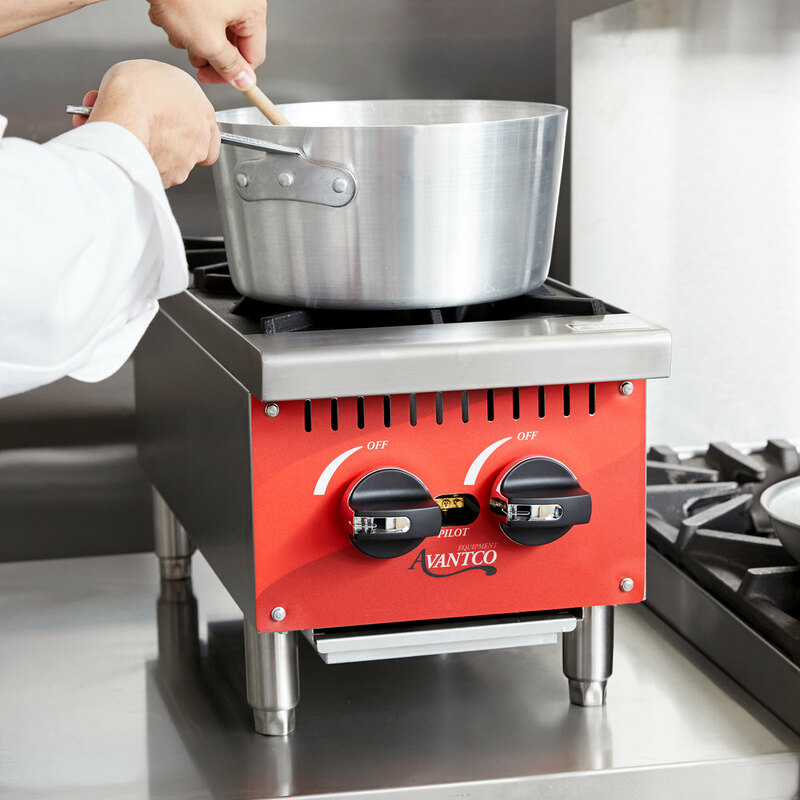 It's also designed with a stainless steel exterior to withstand even the busiest of kitchen environments, ensuring that wherever it's used, it's sure to be a reliable addition to your cooking equipment repertoire. Featuring a removable waste tray that makes clean-up quick and easy, the unit is outfitted with 4" legs that adjust to suit your needs. These lift the unit up from the countertop surface, making clean-up an easy task at the end of the day. The unit uses a total 50,000 BTU for operation. It ships ready for a natural gas connection, but is field convertible to accept liquid propane. Hi there! This gas burner I use 2 month! Work great! Don’t need much space, very easy for use. Looks great. And I recommend that item! Just what we needed in the restaurant. Looks great to. We are very happy with this burner. Shipping was fast and no damage. Highly recommend this product! Purchased this Range along with an Avantco Gas Griddle for my new food trailer. It works great and is easy to clean. The only downside I have come across so far is with some of my smaller cookware not sitting steady on the burners. If you are using a smaller saucepan or fry pan for anything, just make sure to ensure it is sitting balanced. Price was great for a startup on a budget. Webstaurant had the best price for this item. It was easy to convert to propane with the provided orfice. Heavy duty burners and sturdy unit. Very happy with this. Its the perfect size for my food truck. I really like the size of the knobs. Easy to light and turn on. Love my new gas burner. Small compacked but great for small area. This burner make a big job small, it will have your water boiling within 2-3 min. For the price you can't beat it. Great product! fits nicely into our small kitchen. We use it to keep pasta water on a boil and have had no issues so far. 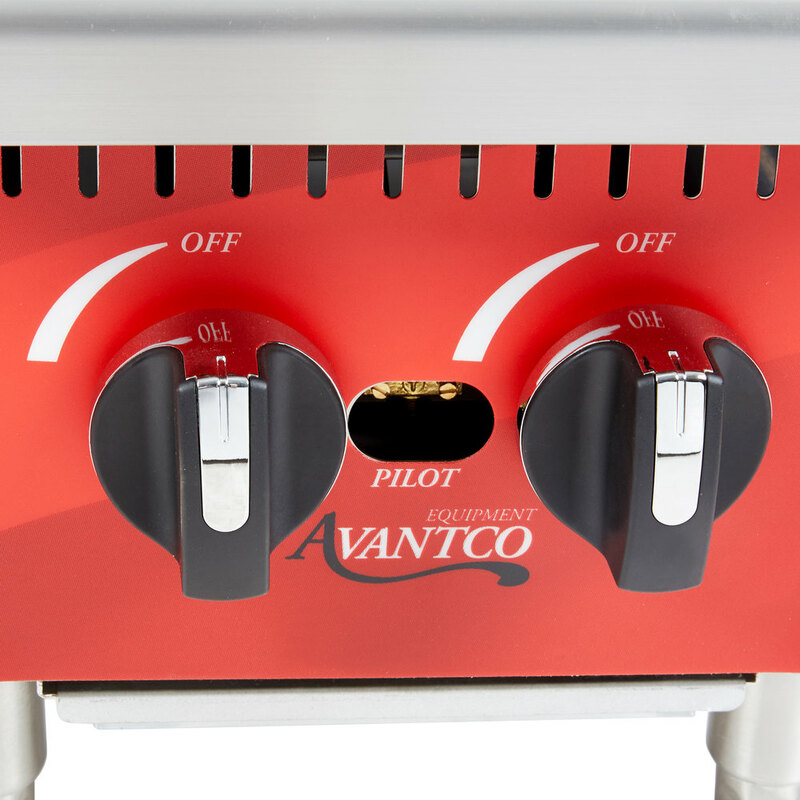 The gas burner was easy to install in our concession trailer and works great heating our food. This item was easy to install and is easy to light and use. I bought this one to match the flat top griddle that I purchased. this too is just the right size for my food truck and has the right amount of BTU's. Love the unit! Sturdy unit that is very easy to setup and extremely easy to tear down and clean in minutes. Legs are a bit tall but not bad. I would definitely recommend this to a friend.